From music to movies to shopping to one-of-a-kind attractions, Wichita has options a-plenty for your family this holiday season. The merry-making begins in early November and runs through the end of December. Here is a selection of November festivities that will usher in the holiday cheer. Enjoy a locally written and produced Christmas-themed parody of daytime soaps when Mosley Street Melodrama presents Holidays of Our Lives, followed by a holiday musical comedy revue. Tickets are $30 per person and include dinner. All ages are invited to build and decorate a gingerbread house to take home and to witness the awe-inspiring construction of a giant one during Gingerbread Village at Exploration Place. If culinary construction makes you hungry, buy homemade holiday treats at the Assistance League’s bake shop. Event fee includes admission to Exploration Place exhibits and a portion of the proceeds will go to the Assistance League of Wichita. Assistance League and Exploration Place member admission is $5 per person; non-members cost $9.50 ages 12 and up, $8 seniors, $6 ages 3 to 11, ages 2 and under free. Gingerbread Village hours are 5:30-8:30 p.m. Friday, Nov. 11; 10 a.m.-6 p.m. Saturday, Nov. 12; 11 a.m.-5 p.m. Sunday, Nov. 13. Stroll through a forest of dozens of uniquely decorated Christmas trees, enjoy refreshments, watch local entertainers, shop for wreaths, sweets and other holiday goodies in the marketplace and visit Santa and Mrs. Claus at the 2nd annual Feztival of Trees at Wichita’s Midian Shrine Center. Admission is $5 and benefits the Shrine Center. The Feztival is open 10 a.m. to 5 p.m. daily. On Sunday, a live tree auction begins at 3 p.m. and a drawing for raffled trees starts at 4 p.m.
Two of Wichita&apos;s favorite funny men are together again this holiday season with a full-length, original musical comedy extravaganza featuring side-splitting Christmas characters, sketches, parodies and, of course, their famous “Kyle and Monte Medleys.” The Kyle & Monte Christmas Musical is staged at Roxy’s Downtown. There are show times Wednesday through Sunday through Dec. 23; ticket prices range from $20 to $30 with dinner available for an additional $15 per person. Gather in the plaza next to the lake for Bradley Fair&apos;s tree lighting ceremony at 5:30 p.m. on Saturday, Nov. 19. Watch the shopping center’s 35-foot Christmas tree and miles of crystal lights come to life then take a photo with Santa and his reindeer friends. 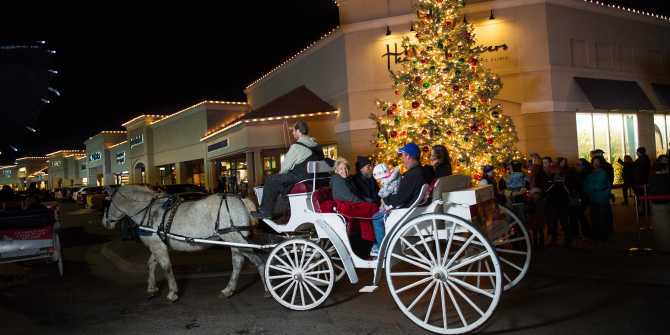 Immediately following the tree lighting, guests can enjoy horse-drawn carriage rides through Bradley Fair. The free carriage rides originate from the fountain at Bradley Fair Plaza and operate from 6 to 10 p.m. Nov. 19, 25, 26 and Dec. 2, 3, 9, 10, 16, 17, 23. Cuddle up to your sweetie or start a holiday family tradition with free horse-drawn carriage rides in Old Town Square every Saturday from noon to 4 p.m. Enter a true winter wonderland with a stroll through Kansas’ most grand Christmas light display. Illuminations at Botanica features over one million lights glittering throughout the 17-acre gardens. More than 5,000 LED luminaries will line garden pathways, more than 120 trees will be expertly lit and many structures will twinkle with white lights. Imagine the warm glow of luminaries, the reflections of trees on the pond, the magic of the flocked forest at Candy Cane Lane, the fragrance of chimineas, the warmth of hot cocoa and cider and the joy of live musical groups. Illuminations starts Nov. 25 and is held seven days a week, 5:30-8:30 p.m. through Dec. 31 (excluding Dec. 24 and 25). Tickets are $8 ($7 members) for adults and $6 for youth (3-12). Exploration Place will show “Let It Snow” in the Boeing Dome Theater again this season. The fun-filled, larger-than-life show for all ages features joyful holiday imagery set to classic holiday music from Frank Sinatra to the Muppets. Tickets are $5 for adults, $4 for seniors and $3 for youth (3-11). The dome does not require general museum admission. Call 316-660-0600 for daily show times. Kick-start your holiday season with free holiday classics at 10 a.m. every Saturday until Christmas at Warren Old Town Theatre Grille starting with “It’s a Wonderful Life” on Nov. 26. Other films: “A Christmas Carol” on Dec. 3, “Elf” on Dec. 10 and “Miracle on 34th Street” on Dec. 17. The popular Kansas in Miniature exhibit inside Exploration Place will be decorated to depict a 1950s holiday, including a Christmas parade and nostalgic music. The exhibit is included in general museum admission. Stay tuned for our next blog post covering what to do in Wichita in December. There are holiday-themed experiences at attractions and venues across Wichita, including the national touring Rudolph the Red-Nosed Reindeer: The Musical making a stop at the Orpheum Theatre, holiday concerts from the Wichita Symphony Orchestra and holiday traditions like Nutcracker Ballet and the Trans-Siberian Orchestra. A full holiday event calendar is available at www.visitwichita.com/holiday/. Download the free Visit Wichita mobile app available for Apple or Android smartphones and tablets.